If you live in a wooded area with plenty of forest trails to explore, chances are your kids will be spending a good deal of time playing in the trees and brush this summer. While it's certainly encouraging to see little ones enjoying the great outdoors, it's important for children to watch out for poison ivy when exploring the woods. Here are three ways kids can stay safe from poison ivy during summertime play. 1. "Leaves of three, let them be"
This old saying is an easy-to-memorize way for kids to recognize poison ivy in the forests. Poison ivy comes from a large, hairy vine and is distinguishable by its three leaves branching out from a single point on the stem. In the summer months the leaves will be green, but by late summer and early fall, they may begin to take on a reddish tint. Whenever kids are out playing in the woods, it's important they they wear long pants that cover up their legs. 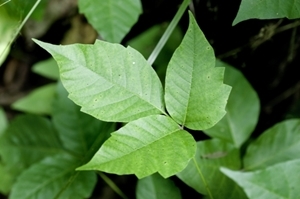 Even when looking out for poison ivy, it can be easy to mistake or overlook among other plants in the woods. Wearing a pair of jeans with socks and shoes that cover the ankles can protect the likely place where skin can come into contact with poison ivy. If kids to come into contact with poison ivy, quickly washing the skin with soap and water within several minutes can stop a rash from developing. The important part is to scrub gently with cool water to keep the irritating oil from penetrating the surface of the skin. You should also immediately wash and clothing that may have touched the oil as well.